Spray 5-quart slow cooker with cooking spray. In 12-inch skillet, cook half of the beef over medium-high heat 5 to 7 minutes, stirring occasionally, until thoroughly cooked; drain. Remove beef from skillet to slow cooker. Repeat with remaining beef. Add onions, garlic, chile, tomato paste, tomatoes, broth, chili powder and cumin to slow cooker; mix well. Cover; cook on Low heat setting 8 hours. Garnish individual servings with cheese and green onions. This recipe makes plenty, so you can freeze some chili for another night. Want the chili but not the beans? No problem! This no-bean chili recipe combines the ingredients you love and leaves out the ones you don’t. Typical Texas-style chili ditches the beans in favor of hearty beef and spice, and this chili is no different. This dish is perfect for the main course of your next family get-together. You can prep in 25 minutes and entertain during the 8-hour cook time. If you don’t eat it all, no sweat. This recipe is freezer friendly and can be reheated for another night. 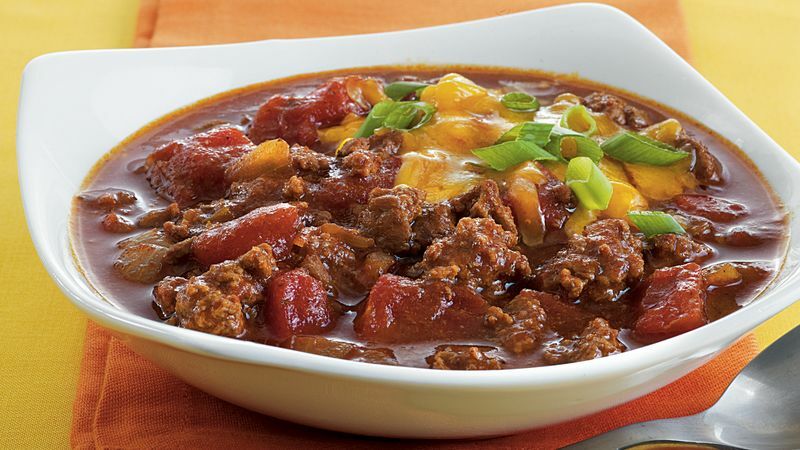 While National Chili Day takes place every fourth Thursday in February, you and your family can celebrate this dinner staple any day of the year. From white chili to slow-cooker chili, our easy easy chili recipes will have you eating in no time. Want a refresher on the chili cooking process? We’ve got you covered.